On the Pledge- What's Happening in Texas? Almost a year ago, a girl in Texas remained sitting during the Pledge of Allegiance. Her reasoning is that the pledge does not seem to apply to her. Whether you agree with that statement doesn’t really matter- it’s not something worth digging into on Oppo. However, being that this is America and we generally don’t respect peaceful protest, the school’s principal pulled her from class and she was expelled from the school. For sitting during the pledge. The girl who was expelled, India Landry, has sued the school district for violating her freedom of speech and right to due process. Many have pointed out that the school district has a policy that students who don’t want to stand for the pledge are allowed to sit- on the condition that a note is provided by their parent or legal guardian permitting them to exercise a constitutional right. No. The Supreme Court has held that it is just as much a violation of your First Amendment rights for the government to make you say something you don’t want to say as it is for the government to prevent you from saying what you do want to say. You have a right to remain silently seated during the pledge. All students have a constitutional right to protest in school, as long as it does not interfere with the goings on of the classroom. 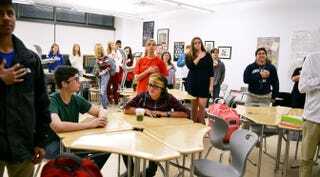 Sitting during the pledge does not interfere with the classroom. It is tangentially, if at all, related to schoolwork. Side note- throughout highschool, I said the pledge exactly zero times. There weren’t even flags in most of the classrooms. I didn’t really realize that it was so commonplace outside of Elementary schools. So why did the Texas AG come out in support of the pledge? Simple. The AG is an elected official in Texas, and elections are coming up. He’s just playing off of the D/R polarization and the Nationalistic tendencies of his constituents. The whole thing reeks of bad politics at the expense of a young girl’s education.